The Khmer Empire, now known as Cambodia, was one of the most powerful empires in Southeast Asia. 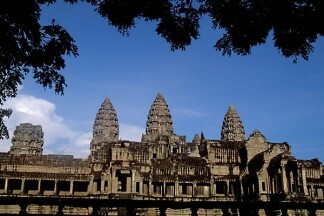 On this tour you visit Khmer temples, architecture and historical monuments. Along with colonial architecture you explore Angkor Wat which is the best preserved example of Khmer architecture. Hundreds of other temples have been discovered in and around the region. End your trip by relaxing on a white sand beach. Historical Cambodia lets you discover Cambodia’s ancient past and experience the present through its thriving evolution today. Arrive in arrival in Siemreap, a small, charming gateway town to the famous Angkor temple comlex, meet your local guide and transfer to the hotel for check in. After breakfast, enjoy a fun tuk-tuk ride to the intricately carved Khmer ruins at Angkor Wat, one of the world’s most impressive temple ruins constructed between 9th and 13th centuries. The temple still owns hundreds of fine carvings of Apsara and Hindu mythology. Stroll around the massive hallways and discover small shrines still in use today by the local people. Continue your culture tour with a visit to the picturesque Ta Prohm, a jungle-clad temple with overgrown trees, giving a haunting and exotic atmosphere. The magnificent roots of a tree push itself between the temple’s huge stone blocks in an embrace, emphasizing the ‘lost city’ feel. In the afternoon, drive 35km to the rural outskirts and visit to the pink sandstone Bantei Srei temple, the birthplace of classical Khmer architecture. After breakfast, travel by land to Battambangm, home of the best-preserved colonial architecture in the country and some of the most hospitable Khmers you expect to meet. Upon arrival, transfer to your hotel for check in. In the afternoon, embark on a walking city tour around colonial buildings and local villages. Visit the local fish market and observe the daily life of local people. In the morning, explore interesting historical sites including the top hill Wat Banon dating back the 11th century, Wat Ek Phnom surrounded by bodhi trees and lotus ponds that give this place a relaxing feel, Wat Phnom Sampov with carvings in pretty good condition. Then enjoy a fun bamboo train through countryside scenery and charming villages. In 1975, the radical Khmer Rouge party, under its leader Pol Pot, seized power and declared ‘year zero’. In the next 3 years, an estimated 2 million Cambodians died, many from starvation and exhaustion, while others were tortured and executed for being ‘enemies of the state’. Learn more about these terrible years through a visit to the infamous Tuol Sleng Museum and Cheung Ek, better known as the Killing Fields, where large numbers of people were killed and buried. Return to town. After breakfast, visit the Victory Monument as well as the Royal Palace, built by the French in 1866, a beautiful combination of eastern and French architecture. Located within the Royal Palace compound is the Silver Pagoda, so-named because its floor is made up of 5,000 silver tiles. Then, continue your visit to the National Museum, designed in Khmer style by a French archeologist and painter in 1917. The museum houses Khmer art and sculptures from different periods of Cambodian history. After breakfast, transfer to the beach resort Sihanoukville, a journey of around three hours. With white sand beaches, warm waters, and a laid back atmosphere, Sihanoukville provides a great little tropical getaway. Arrive around midday and transfer to your hotel. The rest of the day is at your leisure. After breakfast, immerse yourself in the small town and visit the, market, the international seaport, railway station, the fishing village and Wat Krom. The rest of the day is at your leisure. Early morning drive to the town of Kampot, located at the foot of the Elephant Mountains which boasts beautiful offshore islands and interesting limestone caves. In the afternoon, visit Teouk Chhu and enjoy a city tour strolling among the French Colonial buildings that line the riverfront. A scenic drive will bring you to Kep, a small fishing town on the gulf of Thailand. Your day is free at leisure to enjoy the secluded white sand beaches at Koh Tonsai and Rabbit Island.